The fascination of the combination of two ancient modes of transportation in the world of nature . Starting point of this tour week is the typical Norwegian small town Molde. At the harbor, the skipper will be awaiting us on his sailboat. We can start. An exceptional week in the land of the Fjords of Norway can start. Snow covered mountain peaks, deep blue fjords, a fascinating mountain world. Tours you have always dreamed of up to 1550 Hm. Flight via Zuerich – Oslo to Molde (flight time about 2.5 hours). Checking in on board and sailing towards tour destination. 6 tour days in another world. Using furs, we will climb daily 3-6 hours to the mountain peaks between 900 and 1550 Hm. Depending on the snow conditions, we will either carry our skies for a few minutes or put then on directly on the beach. The tour possibilities are numerous and will be depend on the capability of the guest. Steep descends directly down to the beach or smooth, minimally steep slopes. In the early afternoon, we will descend down to the ocean. A breathtaking descent. Afterwards, relax, sail or a little sightseeing by foot. Saturday: Sightseeing of the city and last minute shopping. Departure back to Switzerland. The 18-meter sailboats Auno with its double or triple bed cabins, bathroom with shower, foyer with table, dining room and kitchen, warm water, fridge, heater, CB, phone, stereo and lots more. - Return flight Zuerich – Molde. - Transfer to the harbor. - All meals included on the boat. 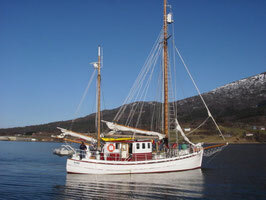 - Meals on day excursions. - All non-alcoholic beverages on the sail boat. This week can also be done as a snowboard tour. The sail crew includes skipper, mountain guide and 5-7 participants, which means we will need true team spirit. We will be following the traces of the first pioneers, who in 1903 tried to conquer the Walliser alps from Chamonix to Zermatt using their skis. 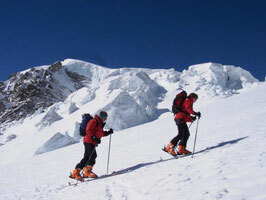 For the Haute-Route from the Mont Blanc to the Matterhorn, you should have some experience in skiing. The climbs are in part very steep and a well practiced walk with furs and iron are necessary. Good physical condition for 5-6 hour climb are required. Meet at train station Martigny at 3 pm. By train to Argentiere. Overnight in a hotel in Argentiere. By train up to Grand Montets 3297 m. First short descent to the glacier d’Argentiere. Steep climb to the Col du Chardonnet 3323 m, 3 hours to the Fenetre du Saleina 3261 m and descent to the Cab du Trient 3170 m, 2 hours. Long descent across the Val d’Arpette to Champex 1477 m. By bus to Verbier and climb to the Cab du Mont-Fort 2457 m.
Wednesday: Rosablanche 3336 m. Descent to La Barma 2458 m and climb up at the edge of the Lac des Dix to the Cab des Dix 2928 m.
Climb to Pigne d’Arolla 3796 m, 3 hours. Short fast descent to the Cab de Vignettes 3160 m.
The longest, but nature-wise most impressive day trip. Over the Col de l’Eveque 3392 m, the Col du Mont Brule 3213 m and the Col de Vallpeline, to the Tete Blanche 3712 m, 6 hours. Gigantic descent from 2100 m down to Zermatt 1600 m. Overnight in a comfortable hotel. As a last high light of this tour week, we will climb the Breithorn 4164 m. Descent over the Theodul glacier to Zermatt 2560 m. Lunch at Furi and end of a great tour week. Departure home. 6 overnights including two meals in the mountain cabins and hotels. 7 days mountain guide/ski instructor. The crossing of the Walliser Alps (from the Matterhorn to the Mont Blanc) is still at the top of the list for many tour skiers. And it should! Technically, the Haute-Route is not difficult, but a good physical condition for 4-6 hours climb is necessary. If you also master the stem-turn away from the slopes, nothing will stand in your way of experiencing a week of your dreams. 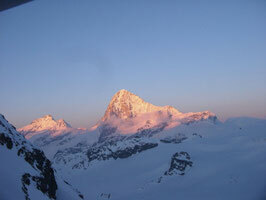 Meet in Saas Fee, 3 pm, Valley station Alpin-Express; climb to the Britania Cottage 3030 m, ½ hour. Depending on conditions, Strahlhorn 4190 m (5 hrs) and over the Adler passage 3789 m or the Alladin passage 3566 m to Zermatt (2000 m descent). Overnight in hotel. Tuesday: Breithorn 4164 m, 2 hour descent over Schwarzee and afterwards climb to Schoenbiel hut 2694 m, 2.5 hours. Tete Blanche 3724 m, 4 - 5 hours. Descent to Cab.de Bretol 3311 m.
Departure over the glacier de Bertol. Climb to Col de L’Eveque 3761 m, 4 hrs. Overnight in Cab. De Vignettes 3158 m.
Pigne d’Arolla 3890 m, 1.5 hours descend to Cab. de Chanrion 2462 m. After a short stop, we will attach the furs and climb up to the Fenetre Durand at 2797 m, 2 hours. Descend to Glacier 1549 m (Italy) and then take the bus to Courmayeur. Overnight in hotel. Ski gondola Col de Geant 3323 m. Impressive 15 km in length descend through the much praised Vallee Blanche to Chamonix 1037 m. In the early afternoon, return home. Bring a few Euro, passport or ID. Schwartor, slight elevation, 1 hour. Imposing descent to Zermatt, 2200 Hm. Heli-flight to Alphubel-Joch, climb to Alphubel peak 4200 m, 2.5 hours. Descending to Saas Fee or Taesch. Spring-snow skiing at the foot of the Matterhorn South Wall to Cervinia. Cima di Jazzi, climb from Stockhorn, 3 hours. Heli-flight Aeschihorn, climb Mettelhorn, 1.5 hours descending to Taesch. Stockhorn, ½ hour descent Gorner glacier to Furri. Afternoon Theodul glacier. Breithorn (4166 m), descending over Schwarztor or Theodul glacier. 2000 Hm descent of your dreams from KL Matterhorn to Gressonay (Val d’Ayas). 6 overnights with two meals in a comfortable hotel. Mountain guide/ski instructor for 6 days. Chamonix, well known to every mountain climber and ski tourist. It not only has the tallest mountain in Europe, but also is one of the best ski variation areas, may it be because of the world wide known Vallee Blanche with its 15 km descent from the Aiguille du Midi 3842 m down to Chamonix 1030 m, or one of the many steep descents..
An impressive variation ski week at the foot of the Mont Blanc. 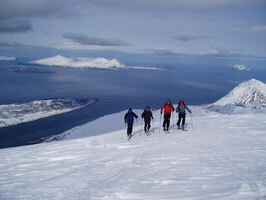 With furs we will reach after 1-3 hours climb one of the many steep descents, hidden glacier slopes and remote valleys. 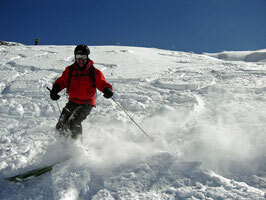 Good physical condition and secure skiing are requirement for this week. 6 overnights including two meals in a comfortable middle class hotel. Transportation from Visp to Chamonix.